To Love owner : Ruler is a tool of people, isn't it? The ruler seem like to be the leader of all people. The ruler seem like to be the owner of all people. But if you looked it in reverse view. Ruler was just a tool of people. Ruler was a servant of people. Ruler had a duty to take care their kingdom. Protect their city. Solve every problem for them. Ruler was not a owner....Ruler was just a loyal servant of all people. "i should not selfish" i think you're missing a word there, as well as "someone who worthy of you" and "take care your kingdom"
if you can't see what's wrong then i'll show you. 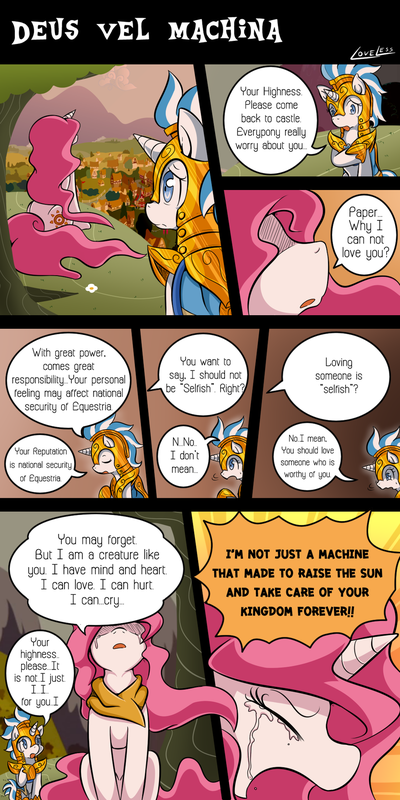 "i should not BE selfish" & "Someone who IS worthy of you" & "Take care of YOUR kingdom"
This is cute, yes, but I want to know if there's an episode where they call princess celestia by the name of "Tia" is that her real name or something? its a nickname that Luna call Celestia Tia it was said in the show a few times its a shorten form Celestia to Tia i hope that clears it up. Again another heart breaking soul so wracked with so much emotions bravo.